The Eric Westacott Foundation has raised over $30,000 for physical therapy for 11-year old Alex Malarkey. The funds will allow young Alex to participate in two separate two-week programs at Kennedy Krieger Institute's International Center for Spinal Cord Injury in Baltimore, Maryland, and to receive a Functional Electrical Stimulus (FES) bike and tilt-table donated by Lorraine Valentini and Chris Reyling. Alex has never had the opportunity to participate in a therapy program, and this is a prospect that will certainly make a difference for him and his family. The Eric Westacott Foundation (EWF), a 501(c)(3) non-profit organization dedicated to the study and cure of spinal cord injuries (SCI), announced today that it has raised over $30,000 to provide physical therapy for 11-year old Alex Malarkey. The funds were raised by the Foundation, with the help of Patrick Rummerfield, the first fully functional quadriplegic in history, during the recently-held EWF Golf Classic Tournament. A Huntsville, Ohio resident, Alex Malarkey was involved in a car accident in 2004, while riding home from church with his father. Alex sustained serious neck injuries as the result of the car accident, which left him paralyzed from the neck down; Alex has been confined to a wheelchair and ventilator since the accident. Patrick Rummerfield, who has known Alex since shortly after his accident, also asked the Christopher and Dana Reeve Foundation to help, by making available to Alex a state of the art RT300 Functional Electrical Stimulus (FES) bike and tilt-table donated by Lorraine Valentini and Chris Reyling. The RT300 FES bike is designed to send electrical impulses to electrodes placed on the patient's muscles, causing the muscles to contract and - essentially - perform a workout. The use of RT300 FES bikes provides people with spinal cord injuries many benefits, including prevention of muscle loss, muscle strengthening, improved circulation, and cardiovascular exercise. 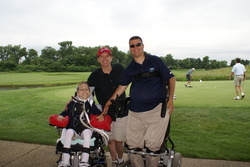 The proceeds of the EWF Golf Classic Tournament will allow Alex Malarkey and his parents to spend two separate two-week stays at the newly-opened International Center for Spinal Cord Injury, a state-of-the-art rehabilitation facility dedicated to targeted spinal cord therapy, part of the Kennedy Krieger Institute in Baltimore, Maryland. The Eric Westacott Foundation will also cover the cost to transport the FES bicycle and tilt-table to the Malarkey's home in Ohio. "It gives all of us an enormous sense of pride and purpose to know that our efforts are going to forever change the life of an intelligent young individual like Alex", said Eric Westacott, President of the Eric Westacott Foundation. "Alex has never had the opportunity to participate in a therapy program, and this is a prospect that will certainly make a difference for him and his family." "Alex is brave young man, who deserves a shot at improving his condition", said Patrick Rummerfield. "The Kennedy Krieger Institute's International Center for Spinal Cord Injury is certainly the most advanced center in the world for this type of rehabilitation program. This is where miracles happen every day, and we wanted Alex to have the best shot possible at healing." The Golf Tournament, which this year boasted the participation of over 100 participants and players from all over the Country, along with a special visit from the St. Louis Rams Cheerleaders, is in its 16th year. Alex made history in January 2009, at the age of 10, by becoming the youngest patient to undergo a surgical procedure that replaced the breathing unit he once was forced to use (weighing over 200 lbs) with a much smaller and lighter one. This surgery has allowed adult quadriplegics to sail solo and skydive. "We could have never done it without the help of the Eric Westacott Foundation", said Alex's mother, Beth Malarkey. "Between the use of the bike and the ability to come to Baltimore to work with the men and women of the International Center for Spinal Cord, we feel blessed. It's like Christmas in August!" The Eric Westacott Foundation, which is run on a completely volunteer basis, has raised almost $300,000.00 for spinal cord research since its creation, in 2002. Patrick Rummerfield is the first fully functional SCI quadriplegic in the history of medicine. Following a 1974 car accident that left him paralyzed from the neck down, Patrick entered an uncharted and grueling regimen of physical therapy and physical and psychological support. With sheer determination and an iron will, Patrick regained function to his limbs, and went on to race marathons all over the world, including the Ironman Triathlon, the Gobi Desert march, and the Antarctica marathon, and to establish the FIA World Land Speed record on an electric car, along with 34 World Firsts. Today Patrick works with the International Center for Spinal Cord Injury at Kennedy Krieger Institute and has co-founded Adventures on Wheels, a nonprofit organization developed to bring the world of adventure to those affected by spinal cord injury. Patrick's primary focus is to bring awareness to the importance of activity based restorative therapies and paralysis research. Patrick is an accomplished motivational speaker and is in the process of writing a book about his incredible life story. For additional information, visit Patrick Rummerfield's website. In October of 1993, while playing in an intramural college softball game, Eric attempted to stretch a triple into a homerun. His headfirst slide resulted in a broken neck, rendering Eric a complete quadriplegic. He spent the next 23 days at St. John's Hospital in Springfield, Missouri, undergoing spinal fusion surgery and acute recovery and completed a rigorous 4 ½ months of extensive physical therapy and disability training at Craig Hospital in Englewood, Colorado. In addition to serving as President of Eric Westacott Foundation, Eric sits on the board of Next Steps Foundation and assists with developing curriculum for Washington University's Program in Occupational Therapy. He is President of the Board for Adventures on Wheels, a charity dedicated to providing outdoor experiences to mobility impaired children. Additionally, he spends considerable time giving motivational speeches and advocating for stem cell research. Eric is a member of the Bar for the states of Missouri and Illinois, a member of the Bar Association of Metropolitan St. Louis, and a member of the American Bar Association. For more information, visit the Foundation's website. Alex Malarkey with two St. Louis Rams Cheerleaders Alex celebrates with a big check!